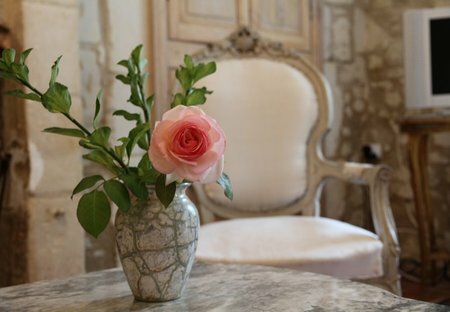 This 15th Century Guest house at Manoir des Rosiers, la maison du manoir, has been entirely renovated, with traditional French furniture. Features a downstairs shower, hot tub and ensuite WC. 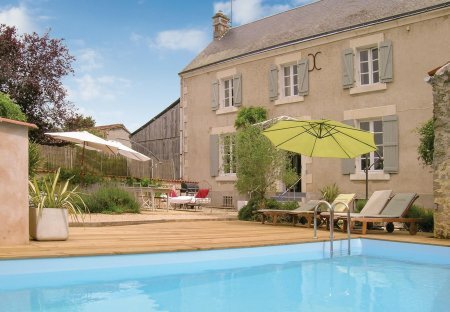 This attractive 3 bedroom house with private swimming pool is nestled in the pretty hamlet of Sainte Radegonde. This 1 bedroom apartment with swimming pool is located in Château-d'Olonne and sleeps 5 people. It has WiFi, a garden and parking nearby. The apartment is near a beach. Lovely fully renovated property dating from 1694 in the grounds of the main house. Shared heated pool in the large garden. Located between Saumur and Angers surrounded by many high quality vineyards. This 3 bedroom house with private pool is located in Olonne-sur-Mer and sleeps 8 people. It has WiFi, a garden and barbeque facilities. The house is within walking distance of a beach. This 3 bedroom house with private pool is located in l'Ocean and sleeps 6 people. It has WiFi, barbeque facilities and garage. The house is within walking distance of a beach. This 3 bedroom house with private pool is located in La Garnache and sleeps 7 people. It has a garden, barbeque facilities and parking nearby. The house is near a beach. This 5 bedroom house is located in Mesquer and sleeps 8 people. This 5 bedroom house is located in Mesquer and sleeps 9 people. This 3 bedroom apartment with swimming pool is located in Bretignolles-sur-Mer and sleeps 6 people. It has WiFi. The apartment is within walking distance of a beach. This 3 bedroom apartment with swimming pool is located in Bretignolles-sur-Mer and sleeps 5 people. It has WiFi. The apartment is within walking distance of a beach. This 2 bedroom house is located in Les Moutiers-en-Retz and sleeps 6 people. It has a garden, barbeque facilities and parking nearby. The house is within walking distance of a beach. This 4 bedroom house with private pool is located in Saint-Jean-de-Monts and sleeps 8 people. It has WiFi and garage. The house is near a beach. This 3 bedroom house with private pool is located in Saint-Jean-de-Monts and sleeps 6 people. It has WiFi and garage. The house is near a beach. This 2 bedroom apartment with swimming pool is located in Bretignolles-sur-Mer and sleeps 5 people. It has WiFi. The apartment is within walking distance of a beach. This 1 bedroom apartment with swimming pool is located in Bretignolles-sur-Mer and sleeps 2 people. It has WiFi. The apartment is within walking distance of a beach. This 2 bedroom apartment with swimming pool is located in Bretignolles-sur-Mer and sleeps 4 people. It has WiFi. The apartment is within walking distance of a beach.